What’s contemporary Thai art scene like? And who’s reappropriating traditional Thai art in today’s modern world? 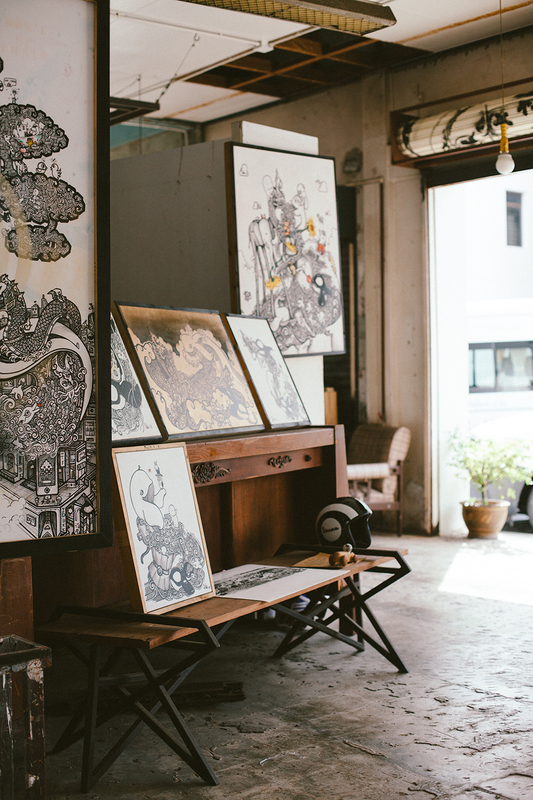 After walking around Phuket Old Town for a while we noticed many local art galleries. The majority of them though had that faux traditional feel to them with the clear audience being us, tourists. You know the ones....like when you go to the seaside and there are paintings of the water, seashells, colourful fish and the sunset. They look good, and the artists are definitely talented, but they're all just so cliche and pretty much all the same. 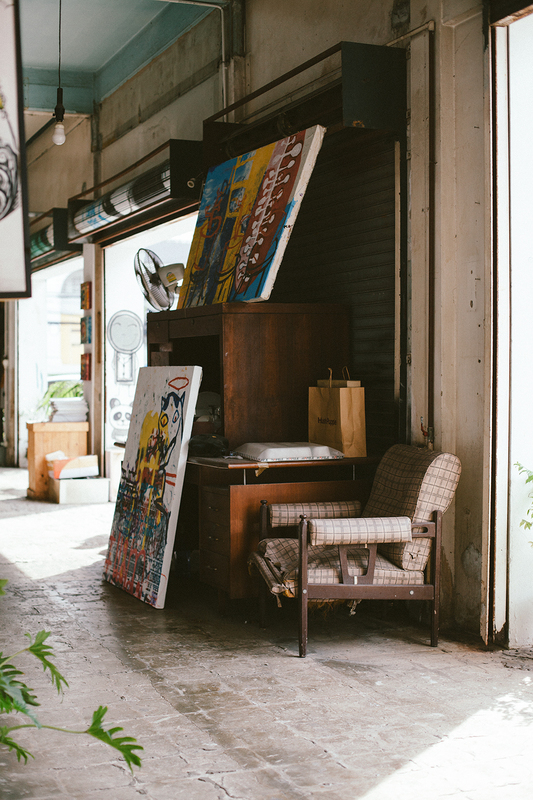 It was when we were walking down Thalang Road that we noticed a shabby garage-like space. It was covered in graffiti drawings. It immediately grabbed our attention. It looked like the building was incomplete; with roller doors covering the spaces where windows should be, and a complete open plan that allowed you to enter from almost any side. 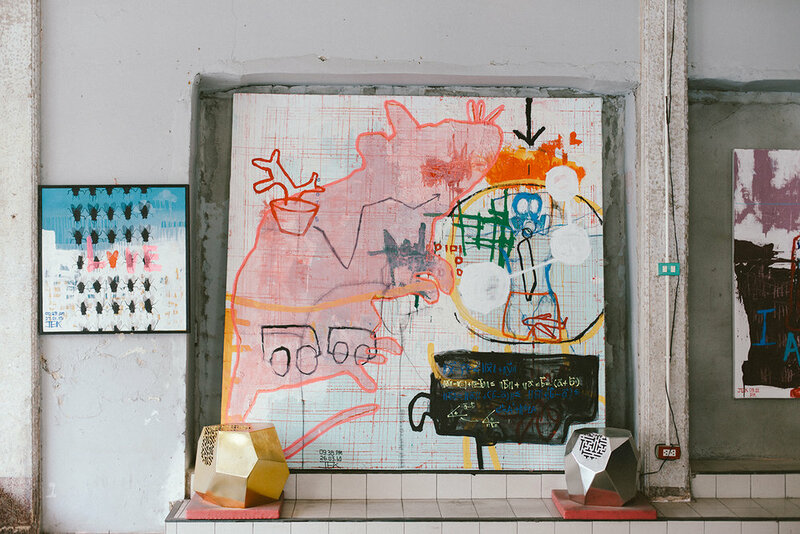 We were intrigued by the paintings, drawings and things like a motorbike or a fridge covered in art, spread across the studio. We could see all of that from the street - even before we entered the building. 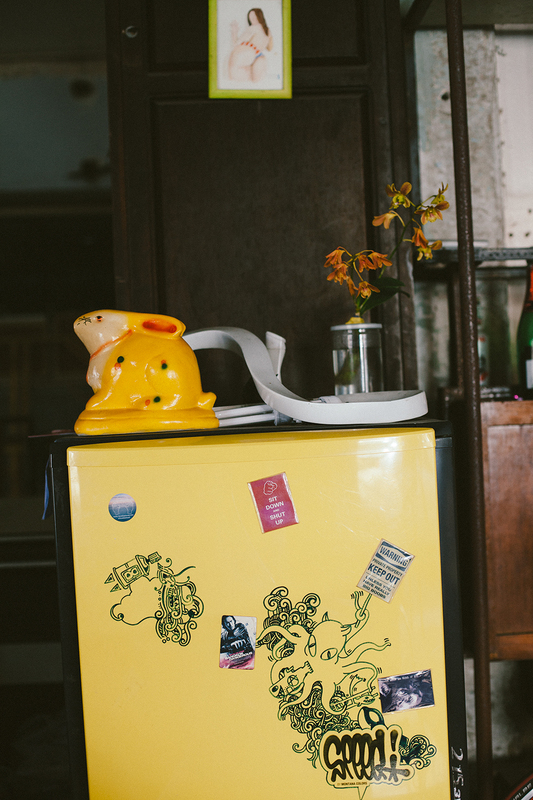 The vibe was undeniably chilled, and we could see some distinctive styles sharing the walls. We quickly realised that we had discovered The Drawing Room of Phuket. A creative space, in the heart of the old town, occupied by 3 artists. Although very different to each other, each artist is contemporary in their approach. 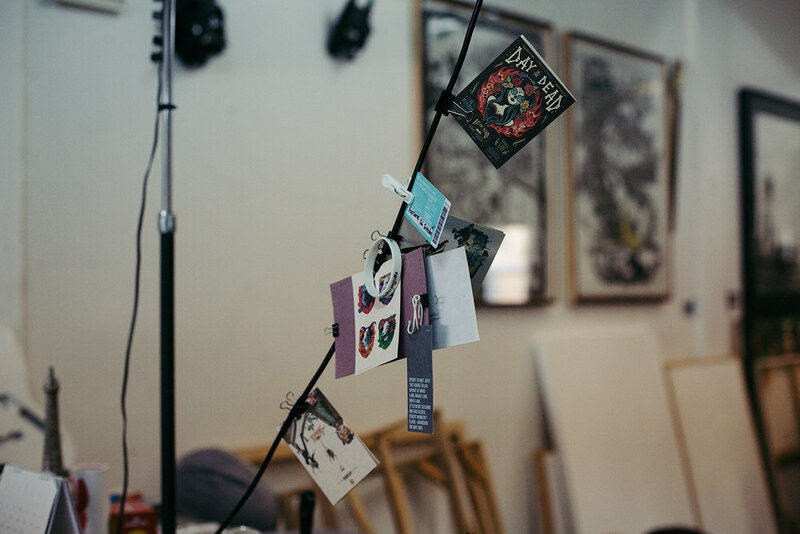 We were fortunate enough to meet some of the creatives and talk about their work. 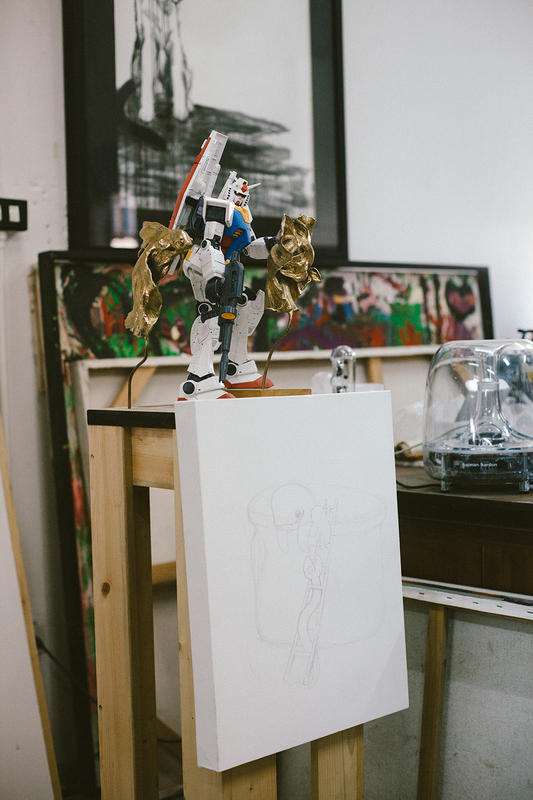 We met Isara (aka Ids) who gave us the rundown on how the studio came to be and talked about the inspirations behind his works. 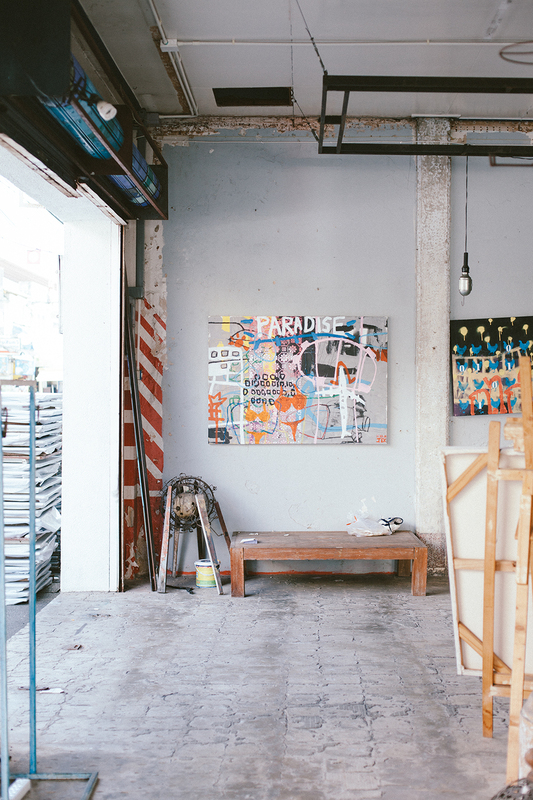 A graduate of fine arts from Bangkok, Ids decided to move to Phuket to concentrate solely on his own creative work. The degree might have helped him in becoming a better artist, but Ids told us he himself realised his own expertises by practicing and observing works of other art masters. After working on various commercial jobs for a few years in Phuket, he decided to ‘trust in himself’ and pursue only his original work. ‘If you don’t start [something new], you will never [have anything] finished’ - he told us. A brave feat for anyone, let alone someone creating contemporary art in Thailand. The space suggested by a friend, today’s Drawing Room, was too big for Ids himself, so he decided he will share the location with two of his colleagues. He set up a workspace on the 1st floor, above the ground-floor gallery, and decided to move into the 2nd floor . As he showed us around the studio, he enjoyed telling us about all the different pieces he’s been working on. Ids strongly believes that ‘everything is art, and art is everything’. This was clearly evident as we noticed all the different things - sketches, doodles, figurines and little knick knacks, which covered almost all the space available. 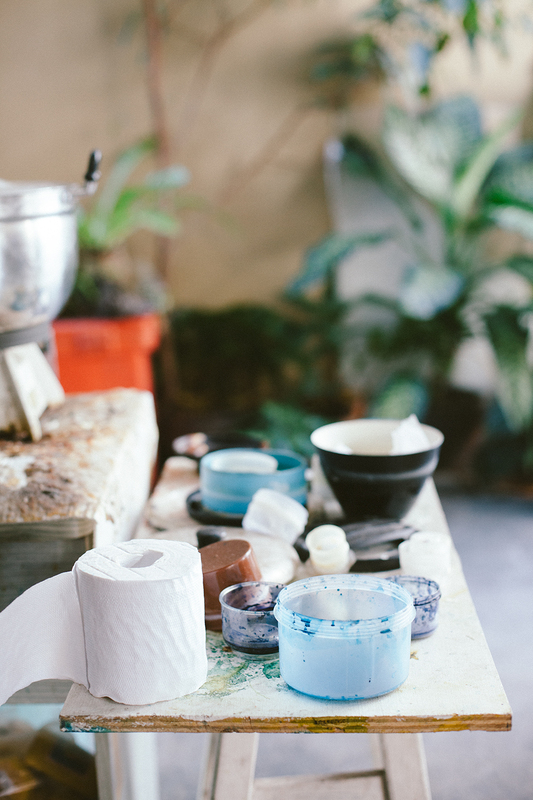 The visit to the artists’ studio was a treat for our eyes. Ids told us he enjoys experimenting with different techniques which was clearly visible throughout the Drawing Room. First, we were introduced to huge canvases (and we actually mean like 2x5 metres huge!) with the beginnings of new pieces. Then, Ids brought our attention to a skateboard deck that he had been working on.Using the traditional Thai & Japanese wood carving techniques he had created an intricate pattern on the underside. He then used the skateboard as an inkpress. Isn’t it amazing to take something so traditional and make it contemporary?! Can you imagine all the skaters shredding on their hand-carved boards?! Ids’s works draw from different artists for inspirations. You can see ideas taken from Warhol (cans), Dali (long-legged animals) or even Picasso (geometric lines) in his pieces. It's the mix match of these artists and his own portion of doodles that Ids brings together to form his own unique style. We even got let into Ids sketchbook, and you know that artists are never too keen to show the secrets of what they’re currently working on. In there, we saw something amazing being created...a huge painting that Ids is working on. It’s inspired by Michelangelo’s fresco, The Creation of Adam, as well as pop culture, and consists of a labyrinth of doodles characteristic for his style. We definitely cannot wait to see this one finished! After looking closely at different pieces of his works, we noticed two characters that appeared in almost every drawing. We were quickly introduced to the ever-present Peepho and Moi. Two lovable and comical characters appear here and there as anything from the main focus point of a piece, to just a little addition in the background. Peepho, a whale-like figurine, was born from the idea of a man sitting in a closed room and looking out at the world only through a small peephole in the door. Moi, a robot-looking character, represents Ids himself. Together Peepho and Moi appear in Ids’s artworks as a symbol of broadening one’s perspective; getting out there and experiencing the world. We were impressed by his artworks, but we wondered how Thai people react to them. ‘In Asia and Thailand, nature of the people is different, they are reserved. They like traditional Thai and Asian art more. They saw it since they were young, they saw it when they were growing up, so some of them don’t want to change [their tastes]’. "In Asia and Thailand, nature of the people is different, they are reserved." Sharing the Drawing Room with Ids are two others: Prasert Pensook and Jek. 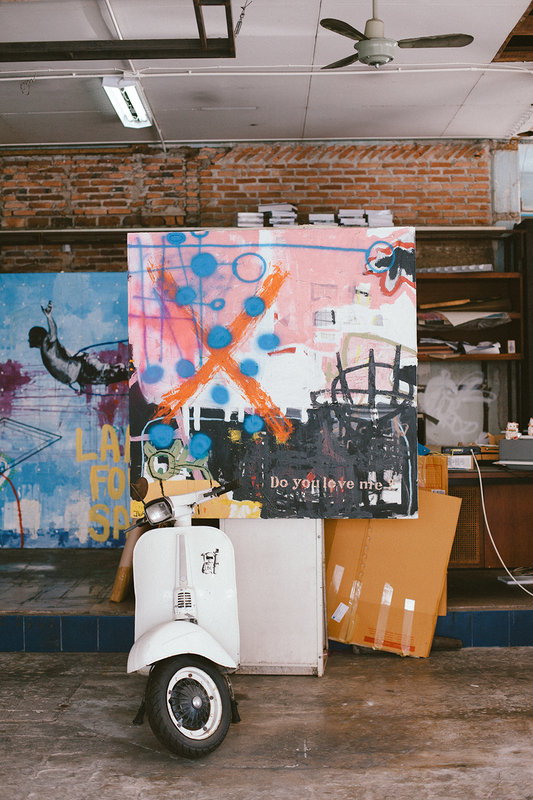 Both of them are contemporary artists using traditional Thai Batik (Prasert) and graffiti-like techniques (Jek). 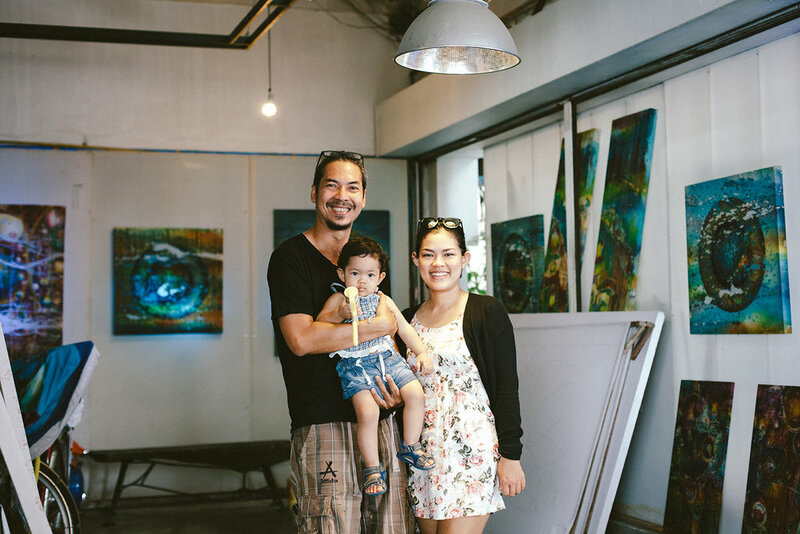 Altogether, there is a strong family and friend vibe in the studio, which we experienced by meeting Prasert’s wife and daughter running in between the artworks. It was wonderful to experience, especially in the today’s art world where everyone is so competitive and often isolated.